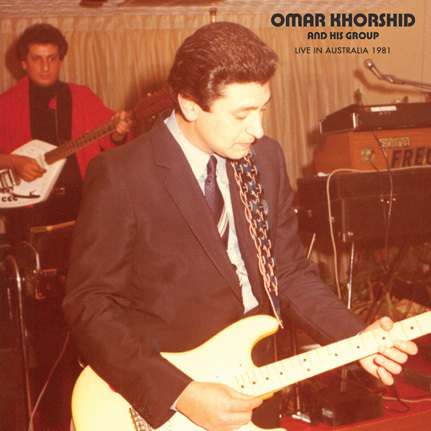 This is the first live concert recording ever issued of legendary Egyptian guitarist Omar Khorshid and his group. It features tracks recorded during his 1981 tour of Australia including live versions of songs that grace his various LPs recorded for Lebanese and Egyptian labels during the 1970s with one phenomenal tune, Al Rabieh, being exclusive here as never before issued in any form. The sound is surprisingly great for a live cassette recording and the band is as sharp and monumental as ever, with stunning instrumental performances throughout including an extended improvisational rhythmic exchange between percussionist Ibrahim Tawfiek and Omar’s electric guitar on the epic track Sidi Mansour. This record is loaded with Khorshid’s signature microtonal Arabesque surf guitar elegance darting atop the backing band’s brilliant accompaniment and the tones of organist Fouad Rohaiem sound raw and abrasive as though it was still 1973. The album has even more nostalgic (and tragic) significance as these shows would be his last; a car accident claiming Omar’s life within 72 hours of flying back to Cairo from Australia. Mohamed Amine, Khorshid’s lifelong friend and member of his group from 1975-1981, recorded these tracks and provided the photographs that embellish the beautiful gatefold jacket that accompanies this LP. Collected and researched by Khorshid historian Hany Zaki in Cairo, this unbelievable treasure is now available for the world to behold. Limited Edition LP release in full color gatefold jacket with exquisite photos from Mohamed Amine’s personal archive and informative liner notes by Hany Zaki.